Nov. 16, 2017 1:00 p.m.
Mayor Tara Veer made the very first donation to the Salvation Army in support of their Christmas Kettle Campaign on Thursday. 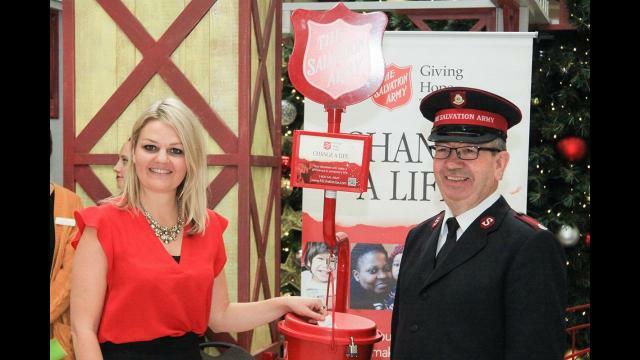 The event, held at Bower Place Shopping Centre, kicked of the annual campaign which hopes to raise $230,000 for the Salvation Army, which provides charitable programs and services for Central Alberta. “Our annual Christmas Kettle Campaign is our major fundraiser for the year for the Salvation Army in Red Deer,” Major Larry Bridger said. “It helps us provide many services, whether it is food, clothing, sometimes furniture, we have a new bed program which provides beds for families in need and we started a program just over three years ago where we assist students at the schools. These services are event more in need this year, with Bridger confirming the Salvation Army has seen a 15% increase in individuals and families using their services this year. “Last year we helped 221 families and 23 seniors with our Adopt-a-Family program and this year it will be much greater again this year. We do need support with that program,” he said. The kettles will be available throughout the City from Nov. 16th – Dec. 23rd and the Salvation Army is currently in need of volunteers to help collect donations. Bridger was appreciative of the support Central Alberta has given to the annual campaign.